This is Lucy Pringle's photo of the Longwood-Warren = "Missing Earth" crop circle. Her web site is: www.lucypringle.co.uk . The 'conjunction is harder to see in it unless made much larger. 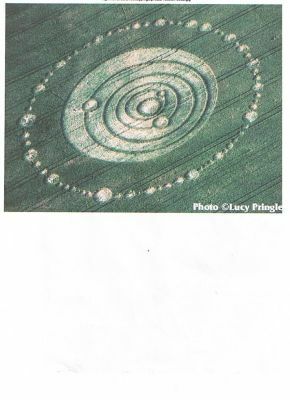 Go to this link to see the "State of the Art" in crop circles from the Barbary Castle to the "Missing Earth" and other beautiful examples at the crop circle connector. http://www.cropcircleconnector.com/anasazi/stateoftheart98.html The irrigation wheel lines are 60' apart. This was not made in one night with a board. The Barbary Castle circle on the cover of the February 1, 1992 Science News shows the explosion that vaporizes Earth. On June 25, 1995 the Longwood-Warren or "Missing Earth" crop circle was put down. It speaks graphically about the result of the initial explosion. Earth is gone. The Barbary Castle was placed down on July 17, 1991 at about 1:35 AM GMT. The date shown by the positions of the remaining three planets in the 'Missing Earth" is July 17, 2003. Lucy Pringle took the ME picture. In addition, the 'Missing Earth" shows exactlly when we are struck by that ray of pure energy from the Sun by using the "conjunction" of two of the ME asteroids = July 16, 2009. I used RedShift5 to verify. The July 16, 2009 date for vaporization was obviously wrong. I initially assumed the countdown our end starts when the Barbary Castle was placed down on thew morning of July 17, 1991. Instead the "Missing Earth" was used to show when the 21 year countdown started on July 17, 2003 as shown by the positions of the remaining planets in the ME. Ergo conjunction is on July 16, 2024. Thank God for being wrong on my initial date prediction. The trouble is no more discrepancies that call date into question.